With the latest update to the iPhone software, some of you might have noticed a few changes regarding apps. Firstly, users now have the ability to remove apps that came with the software, this means the standard calculator can be replaced, you can remove the iWatch app if you don’t use it, and much more. With the software update, there also can the Home addition, which can also be removed if you won’t use it. 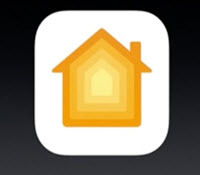 However, Apple has taken the next step to home automation, which is why the app is included. The app provides a full range of features for your home automation, making it the perfect addition for those of you who already have automation systems or those of you who are planning to include it with your next home. There are actually various building companies that can provide the automation systems that work with the Apple app, meaning the systems required will become part of the build and be hidden away a lot better. The HomeKit as Apple calls it has actually been around for a while, but with iOS 10 they have managed to improve on it by a huge amount and also included many additional options and features to take advantage of for all users. The additional app is also sure to get more people into home automation, especially with how easy it is to use the app and everything it can do. 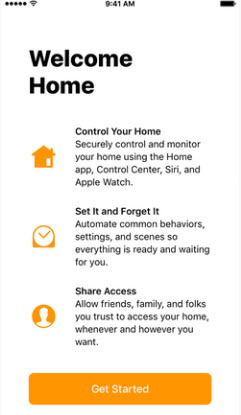 The systems that work with the app can also be purchased in stores, simply look for the HomeKit logo on the box, and you can rest easy knowing it will work with your device. Some of these might require a more technical installation whereas others can be installed by yourself. Should you already have devices that are compatible with the HomeKit from Apple, you can start using the system right away. iOS 10 also comes with a great new look to their Control Centre, which is the slide bar that appears when you swipe upwards on your screen. Here you will find all your quick settings along with the ability to swipe left and reveal music, and the quick shortcuts for HomeKit if you swipe left again. Here you will find all the quick access settings for your home automation, which includes individual devices or settings you have created. In the control centre, you will have all types of information, which includes air conditioner settings, light percentages, and much more depending on the devices connected. In accessories, you can press on a light, for example, to turn it off or press it for long to enter more options, which includes dimming the lights with the slide bar. Entering the app itself is where all the magic happens. Here you can set up new devices, change the settings to some devices, and much more. 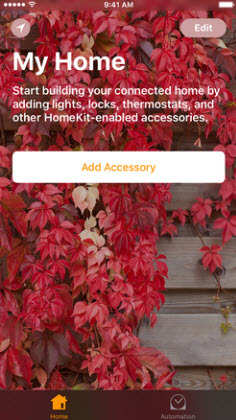 The HomeKit app provides a huge range of different options, which includes a wide range of devices to ensure all the devices are connected to your device. Users can also create scenes, which basically changed your entire home to a certain setting. For example, should you have adjustable lights, automated curtains, and automated underfloor heating, the app will allow you to set up these items for hot and cold days, which can be adjusted by simply pressing 1 button. You can set the floor heating to off, open the curtains, and dim the lights to 50% for those evening you just want to relax with a movie. The lights can be adjusted individually at any time without changing your settings. For the cold evenings, you can change the settings to turn on your floor heating, close the curtains, and increase the lights to 80%. There are many different scenes to create and choose from, which includes a morning scene that will turn on your lights, get the kettle started, and much more at a certain time, as well as evening settings that turns on your lights, unlocks the doors, opens the garage door, and much more when you arrive at home. Want to lock up before going to bed? No problem, simply create a sleep scene, which will lock all the doors, turn off the lights, televisions, and everything else in the house that you have selected in the app.